√ PROFESSIONAL CAKE DECORATING SPATULAS: ★If you like baking cakes, you must have 1Easylife cake spatula set in the kitchen. 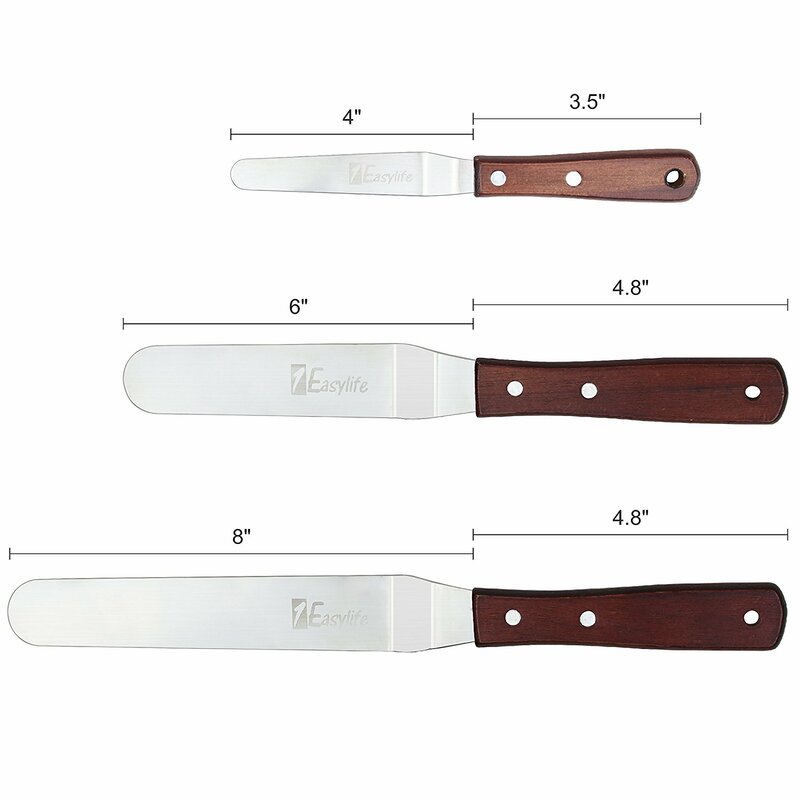 Our cake spatula set includes three different sizes: 4" - 6" - 8" blade (total 7.5''-10.8''-12.8'') from the largest tier wedding cake to the smallest cupcake, you’ll have the right spatula to decorate a cake perfectly. 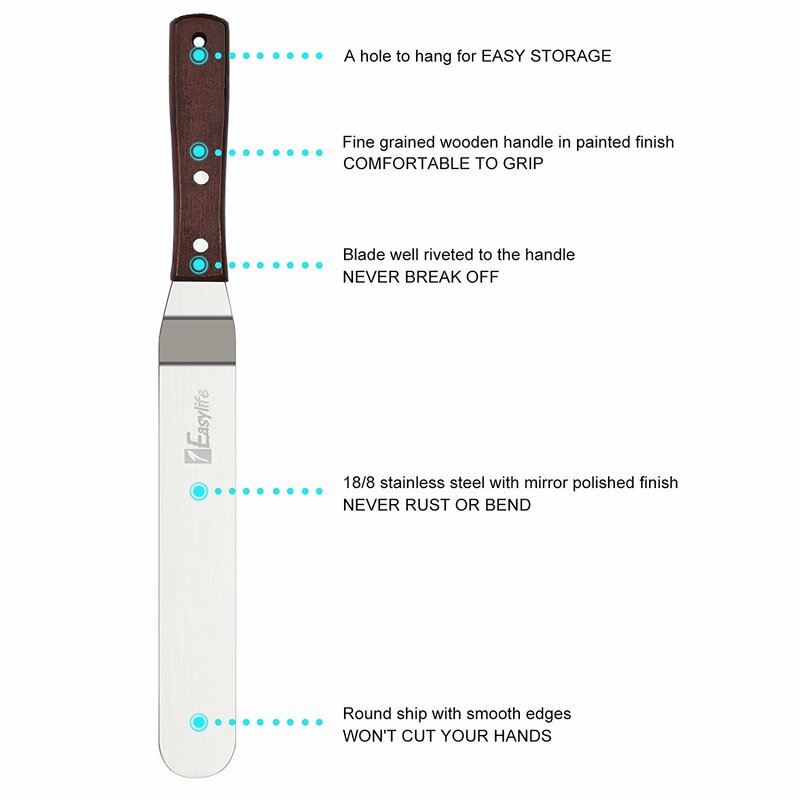 √ FINE GRAINED WOODEN HANDLE: ★The handle is made from beautiful fine grained wood in a painted finish, won’t rot. 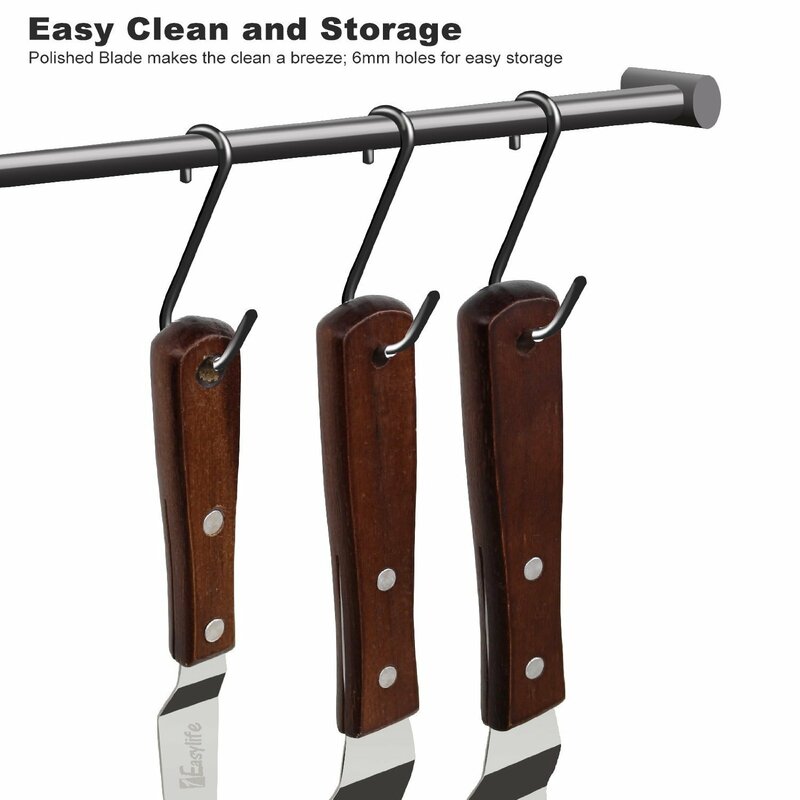 A nice solid weight makes it comfortable to grip, and there is a hole on each handle, which is convenient to hang, and save space. √ 100% SATISFACTION GUARANTEE: ★At 1Easylife, we believe in our products and offer a 18-month-warranty plus lifetime warranty. If you are not satisfied with our products, you can return it no-questions-asked for a 100% refund, so order now with confidence!!! √ ANGLED QUALITY STAINLESS STEEL BLADE: ★Angled blade makes it super easy to ice or top a dessert in a pan, and more flexible so that you can control them better. 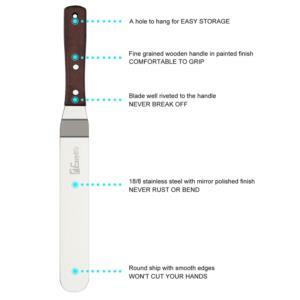 Blade is made with 100% food grade stainless steel, so sturdy and durable, never bend or rust. You Deserve The High-quality Stainless Steel Cake Icing Spatula for Your Baking. √ MULTI FUNCTION: ★Not just for icing cakes or making cheese, they are also really useful for picking up and carrying cakes or pizzas, sandwiches, even cutting curds. 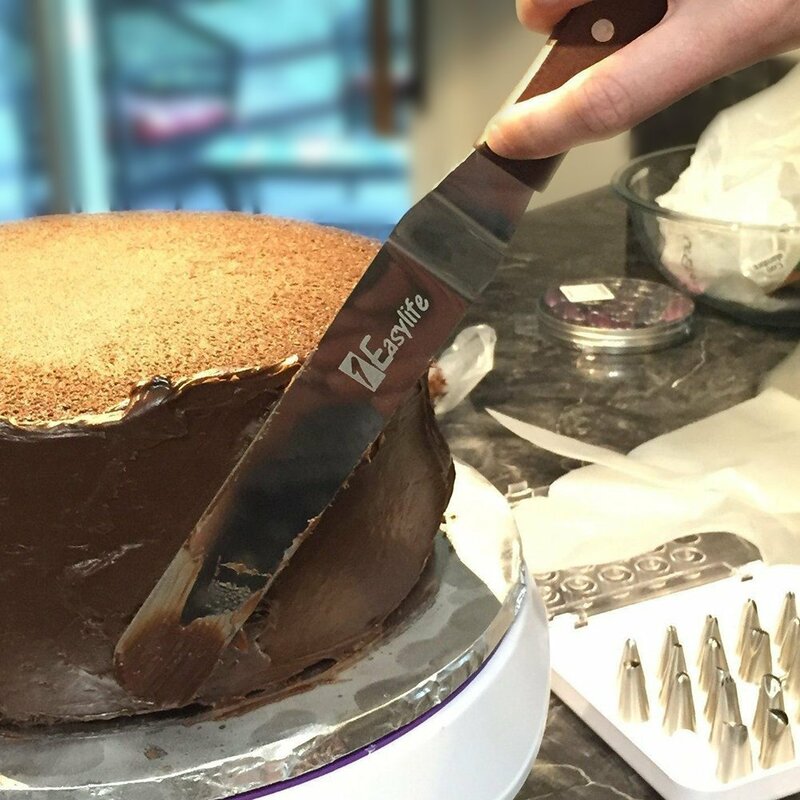 Do you still use a butter knife or a straight spatula for frosting on cake? Or have you always been frustrated that you did not have the right spatula for spreading your icing? Now, you should get a set of 1Easylife Professional Angled Stainless Steel Icing Spatulas for icing a perfect cake. 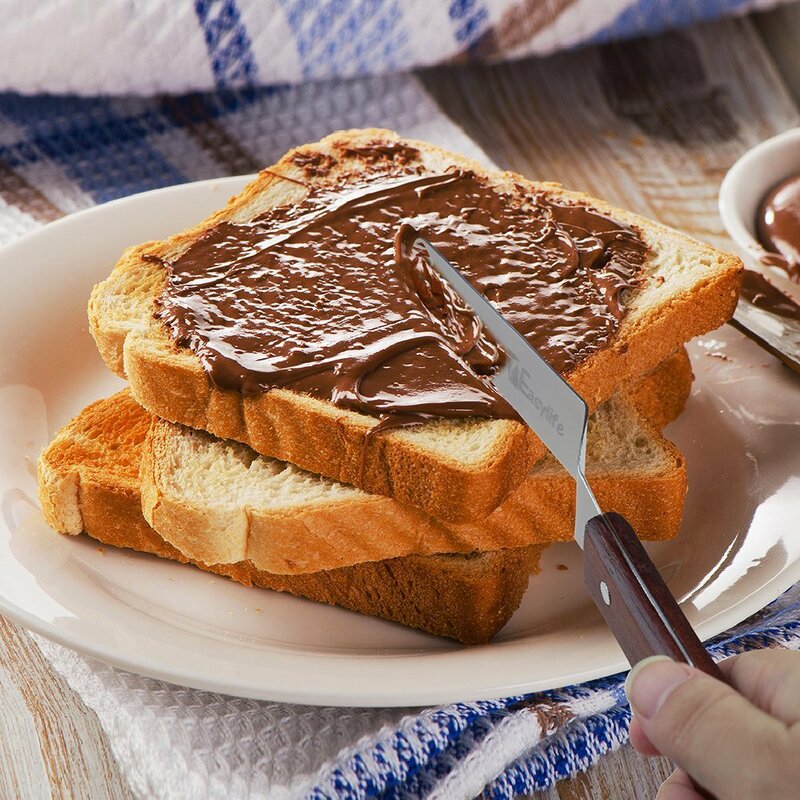 Why choose 1Easylife Icing Spatulas? 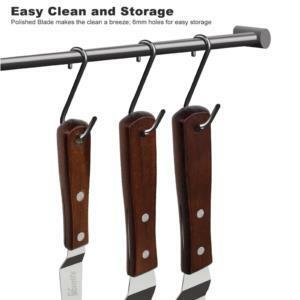 ☆ Convenient: There is a hole on each handle, which is convenient to hang, and save space. The little thing makes your kitchen life easier. **100% RISK FREE GUARANTEE!-- We offer a 18-month-warranty plus lifetime warranty. Order now! Click 'Add to Cart' to enjoy 1 easy life!!! Did anyone else receive two spatulas instead of the 3 advertised? I highly recommend these for a beginner or a seasoned baker.They have a very comfortable wooden handle that doesn't tire your grip.They are slightly flexible but sturdy. Check out the last photo, I was putting quit a bit of pressure on this to make it bed a bit.They all are off set just enough to make it appropriate for icing just about anything.I love the three sizes, now I have one for just about any frosting project I will be working on. I really love the 4" blade for frosting cupcakes and smaller top tier cakes.I don't bake as much as I used to but I know these will be getting plenty of use.I did receive this product at a reduced cost or for free for my honest and helpful review. I do not give stars undeserving. I will try out and use each item I am reviewing personally. So based on my knowledge of this particular item and how the product preforms for me, I will give you my honest opinion of the quality and workmanship. I do post pictures when possible to show items in use. If you have any questions you need addressed about this product, please do not hesitate to ask and I will get back to you asap. I do hope you find this review to be helpful and it assists you in your selection.Thank you. I'm a beginner baker and need all the basic supplies to really take baking to the next level. Angled icing spatulas are a must! They make life much easier and cannot be replaced by anything else in the kitchen. These come in three sizes. The medium one is perfect for most jobs. The large is for bigger cakes. The small one is so cute! Mostly for mini cakes or cupcakes.I love that the handles are wooden because they grip better than plastic handles. The blade is also thick enough that I don't worry about it bending. Overall, this is a quality product. I loaned it to my sister and I don't think I will get them back. *Disclaimer* I received this product for free or at a discounted price in exchange for my honest and unbiased opinion and review. I base my review off my experience with the product. My opinions are my own and I would not rate differently if I purchased at full price. If this review was helpful to you, please mark the helpful option below. If not please comment and let me know. I’m not a baker by all means but I do enjoy making cakes even without the need of a special occasion. This little icing spatula set is fantastic! It comes with 3 different sized spatulas which are a 4 inch, 6 inch, and 8 inch stainless steel blades. 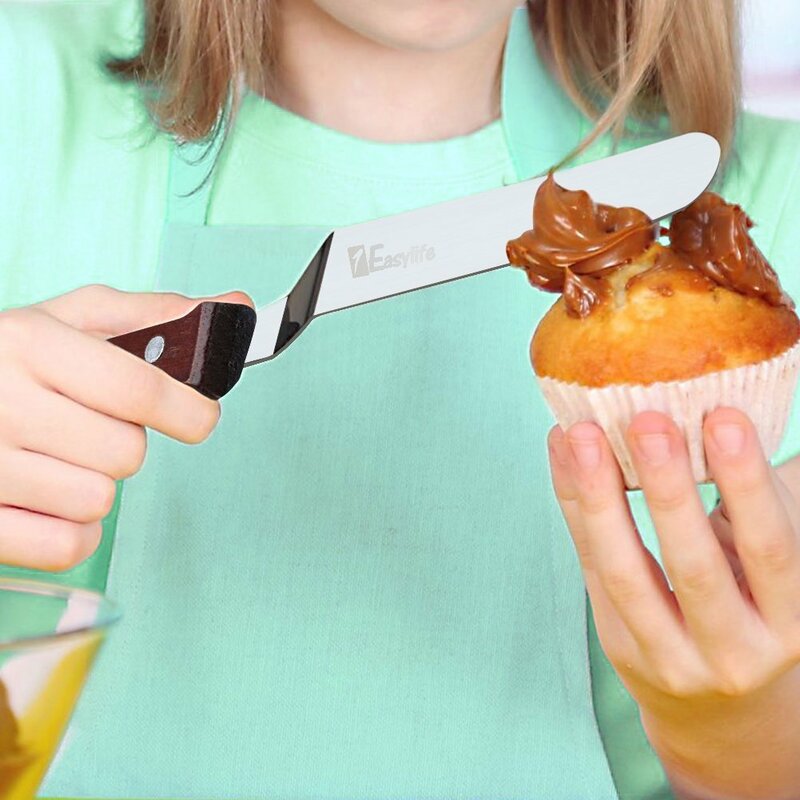 The angled wooden handle feels and fits really nicely in your hands and makes icing a cake or even cupcakes a breeze! 'They are actually great for scooping up your oven baked pizza slices as well. I have only hand-washed these as I don’t want to damage the wooden handle. So far I haven’t noticed any cracking in the handle or any type of wear either.Overall, these are definitely my preferred tool for icing my cakes, I will never go back to just using a knife like a rookie lol. The handles do have a little hold which you can hang them from but I don’t have any hooks in my kitchen for hanging because I’m a bit OCD when it comes to clutter, so these just get stored in a drawer like the rest of my cooking products. Lastly, I did receive this product at a discount in exchange for my honest review. I hope it has been helpful. This spatula set has been great to use because it makes it easier to put icing on your homemade cakes. I used to use regular knives to on cakes and they would not turn out as well because it would either dig into the cake or cut some of the cake off because of it being sharp. This has a smooth side to it but you can still cut your cake if you need to. You can pick up your piece with these as well because they are wide enough to reach down and hold the whole slice. They are light weight and easy to clean. The handles are strong and durable. You get a total of three different sized ones. They all work great and I would recommend them. I received this product for free in exchange for my honest and unbiased review. This is a good quality set of cake icing spatulas. My sister and I will be taking cake decorating classes next spring. I have been purchasing and shopping for supplies to make my sister a gift basket. I thought these cake icing spatulas would be a perfect addition to the gift basket )and they certainly are! ).The set includes three spatulas. The blade sizes are four, six, and eight inches. I thought was a great size range as my sister likes to make cupcakes as well as larger cakes.The blades are made from stainless steel so they are pretty much indestructible. They are rust resistant and very hard to bend. The handles on the spatulas are wooden. They measure just a bit shy of 5 inches long. They are polished smooth so they feel good when I am holding them. No worries about splinters! To try the spatulas out I made pancakes and used the smallest one to spread raspberry jam on mine. 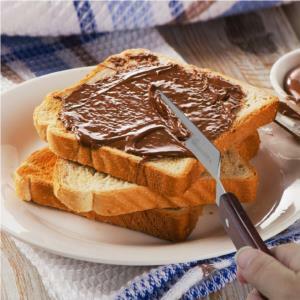 The spatula has a good sturdy feel and applied an even layer of jam in just 2 swipes. Easy and quick! I washed the icing spatulas by hand and I do recommend this method. Dishwashers can dry out the pretty woodwork!I am very pleased with this purchase and can't wait to give them to my sister. Well she gets two of them. I decided to keep the smallest one for me! The spatulas are well made, useful, and easy to use. I recommend them to any baker, whether you just bake cupcakes for yourself or you make wedding cakes.I purchased this product at no cost in return for an honest unbiased review. 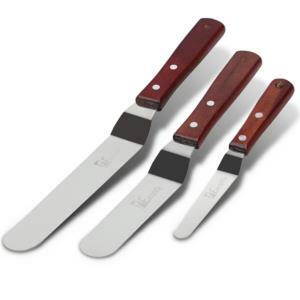 I based my review on my own opinion and experience with the 1Easylife offset cake icing set of three icing spatulas.